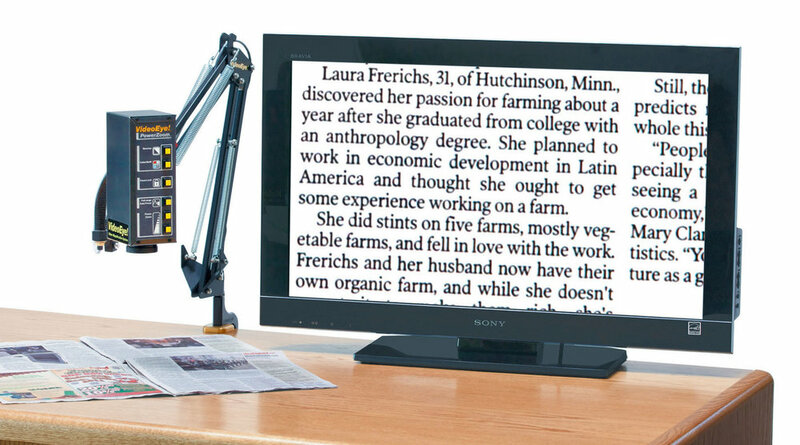 The classic conventional VideoEye models provide a clear magnified image of anything you want to see or read. They are an excellent match for an individual with significant impairment from macular degeneration. The PowerZoom and PowerVue models give the highest magnification power - up to 100x power. That means the letters from a word in a news article can be magnified anywhere from a half inch tall to more than six inches tall! A convenient zoom control that lets you set magnification at the perfect level. All models are self-focusing and feature the patented innovative VideoEye articulating arm that gives stable support for the camera. The viewing head floats over your work surface supported by a machined base that clamps to the ledge of a desk or other work surface. You can order any of these systems at even lower cost: use your own screen to save $400! And save $45 on shipping too! Just call 800-416-0758 and say you want the "$400 arm-only discount."